Hed Stinger 9: It’s So Deep! 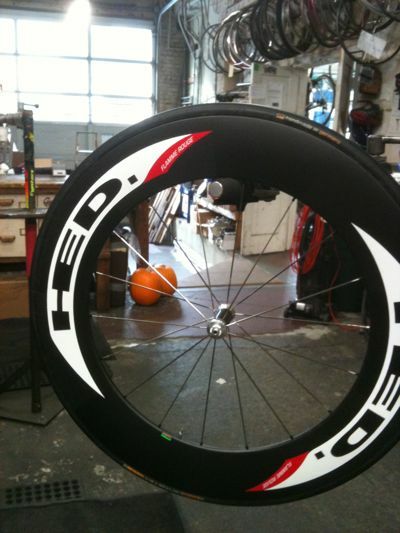 Here’s my new Hed Stinger 9 front wheel. It’s really deep profile: 90mm! This front wheel weighed exactly 697gr on a triple beam scale, without skewer or tubular tire (979gr with a Continental Sprinter). I actually have to point out that the wheel was remarkably true and round ( a lot of carbon wheels are kinda hoppy, though not as much as a typical tubular tire).